Burgers. Seemingly, these stalwarts of the takeaway set follow a fairly simple set of rules: essentially meat and three veg (with a bit of sauce) wedged between a couple of bits of bread. In recent times however, the idea of the humble burger as a meal of convenience has been transformed to something a little more ‘gourmet’. 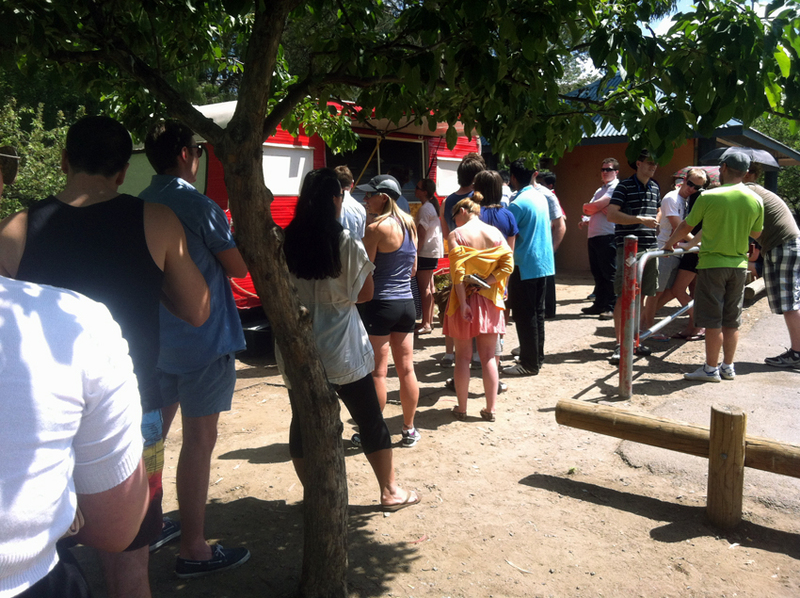 To compare and contrast, The Canberran examined four of our fair city’s burger vendors – two traditional sites and two of the new kids on the block. The most common comment heard in regard to this cute little caravan seems to be “Oh, I’ve heard all about it? Are they good?” No other food van has managed to attract so much attention as quickly as Brodburger. If there is a single reason for this excitement, we’d have to put it down to cheese. The choice of blue, Brie or Swiss on any of the burgers on offer is surely the key to their success. We ventured over to Bowen Park in Barton on a Sunday afternoon having starved ourselves in preparation. Arriving at the car park the popularity of the business was evident. At least fifty people were loitering around the van, some in an orderly queue, the others scattered about waiting for their numbers to be called. We joined the queue…and waited. Twenty minutes later we made it to the window. “I only have two burgers left,” we were told. That suited us, but there was a loud groan from the dozen or so people behind us at the realisation their craving was to go unsatisfied. As those less fortunate dispersed, The Canberran grabbed a bit of shade and waited and waited again. We were expecting it would take thirty minutes for out burgers. When that time passed, there were still another fifteen numbers to be called. Sensibly, many people retreated to picnic blankets down by the lake, returning every quarter hour or so to investigate how much longer they had to wait. One-by-one burgers were distributed to the hungry and patient. Knowing we were to receive the last order all that could be done was watch as the crowd trickled down until only we remained. Finally, an hour and twenty four minutes after arriving at the carpark, we had the our prize. Scurrying back to the car, we sped for the comfort of home-base to examine the burgers. Once unpacked and laid out on plates it was time to tuck in. The buns were wonderfully fresh – firm, but yielding as they were bitten through. The blue cheese was a sensation – hiding just behind the flavour of the beef, revealing itself late on the palate and without any of the sharpness normally associated with blue cheese. In terms of size, the Brodburger satisfies without leaving you with a feeling of being over-filled. Truly, this was a product worth the wait. We all know what this is. It’s the same in every one of the four gazillion Macca’s stores located throughout the universe. If you’ve never eaten one, you’re probably never going to. In that case, scroll down to burger Number Three. 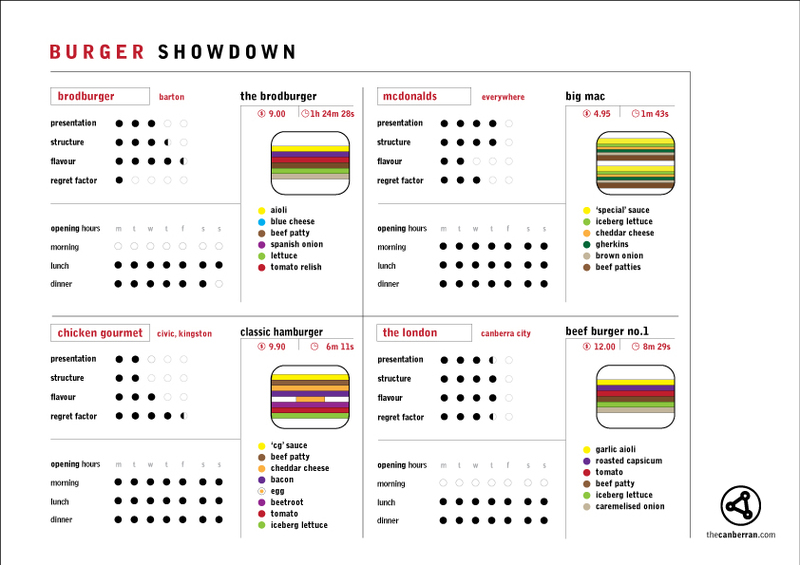 Given the familiarity we have with this ubiquitous burger, there is little need for in depth analysis of the product. There was only one simple fact that struck me as I examined the Big Mac with a critical eye, and that is how small it seems. For a burger with such a superlative in its name, one might expect something a little more formidable. 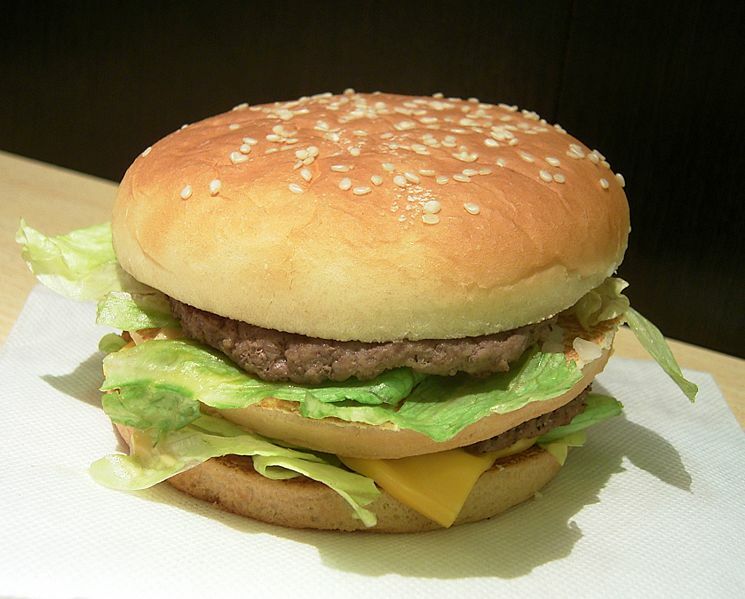 The contradictory scale of the Big Mac meant it took almost as long to eat as it did to order it (7 seconds). Unfortunately, by the time I was licking the last of the ‘special’ sauce from my fingers, I was beginning to wish I hadn’t eaten any of it at all. It appears ‘Macca’s regret’ is only ever a brief drive-thru away. The overwhelming majority of Chicken Gourmet product is consumed by customers in one of two states: drunk or hungover. With this in mind, I was curious to take on one of their burgers in a thoroughly sober state of mind. The shop was completely empty when I entered. Even the counter attendants were out the front having a smoke. While examining the menu board I heard frantic shuffling as the cashier rushed back in to receive my order. I requested their Classic Hamburger (35 seconds) and waited, shivering as the weather changed and my anticipation built. Sooner than I had expected, the hot burger was in my hot little hand. I turned tail and made from home, keen to experience the product in a similar environment to the Brodburger and Big Mac. Once halved and examined for the ingredients, it was time to dig in. By the time I was halfway through, regret was kicking in. This was due to the size of the burger (somewhat larger than the previous two tests) and the amount of grease in the patty and bacon. It was delicious though, every bit the classic burger one might procure from the local takeaway. Along with the bacon was egg and beetroot, long considered essentials in the Australian interpretation of the classic. Undeterred and dedicated to the cause, I powered on through. By the time it was over I had gone very quiet, sitting in some sort of food coma as the weight of the grease and eggs landed finally in my belly. Had anyone been there to witness this act, I would have asked them to award me a t-shirt or a plaque. Instead, it was just me and Anton Enis, and he had bigger fish to fry that evening. While it is tempting to get into a full review of this somewhat unexpected venue, let us stick to the issue at hand. Having not visited The London before, The Canberran was keen to dine-in to try to make sense of this nightclub-come-burger joint. I really wanted to get something of a feel for the venue, though more about that at a later date. Ordering from the bar, I was served quickly (22 seconds) and retreated to my table somewhat concerned at the price. Let’s face it, $12.00 is a bit of an ask for a simple burger. My impression changed when it turned up though, as I realised that on a per kilo basis, this was probably a bargain. In addition, there was a generous serving of delicious looking chips. Unfortunately they would have to wait; I wanted to make sure I could get through the burger. By the time the fourth Pitbull track had blared itself to completion, the burger had been polished off. My thoughts? Well, the bun was magnificent, possibly the highlight to be honest, although credit has to go to the garlic aioli and the roasted capsicum. It was indeed a tasty burger. While Macca’s and Chicken Gourmet serve styles of burger we’re all familiar with, these certainly have their place. Be it on a road trip or the road to recovery, sometimes nothing else will suit as well. The modern takes supplied by Brodburger and The London provide a completely different experience. These take the burger to the echelon of dining experience, albeit a rather relaxed one. Whether huddled around one of the booths in Civic , or relaxing on a rug with friends by the lake, the relative burgers are more about biting into, chewing, making noises of approval, and watching for the nodding heads of your fellow diners. 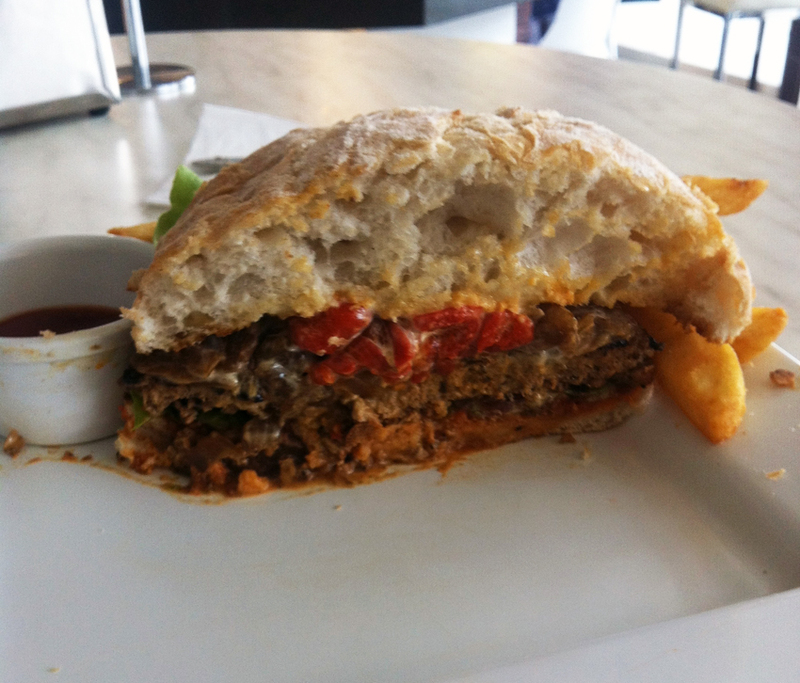 The Canberran tips a hat to those pushing the envelope of the burger. With the current success being experienced by Brodburger and The London, it looks as though they are here to stay. For those who prefer eating with their hands and friends, this can only be a good thing. One day. Soonish. 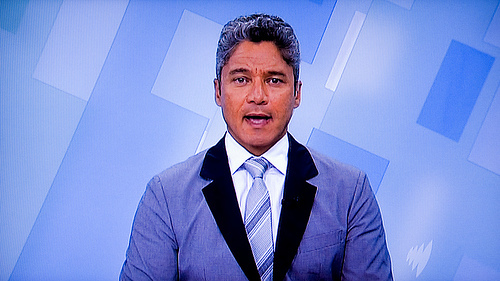 I will make my Brodburger debut and then I will feel like I have experienced Canberra.